Jean's Quilting Page: Hide and Seek anyone? I found Smokey in the middle of the quilt sandwich while it was ON the quilting machine. Do you have helpers like this? Yes, I have one of those. Every single time one of my quilts comes back from the longarm quilter, Millie makes a point of giving the quilt what can only be described as a "Quality Assurance Check." She lies on the quilt, gets under it, and otherwise makes herself very comfortable on it. She has been known to give herself a "baff" on them and is very good at "holding them down." Yup, I have one of those. Hi Jean! Sadly we don't have any kitties to cuddle in our quilts. They make quilts seem all the cozier, don't they? Smokey's hide and seek photo is so funny - I swear he is smiling! Love the kitty in the pile of strips!! Lovely helpers. You have some great helpers and they are so cute too! Strings! What a great cat toy! It took me a second to see that little guy camouflaged in the pile of strips. It looks like his buddy is pulling them down, trying to cover him up. Hahaha, that's incredible that your cat got between the batting and backing. I love the hidden cat in the pile of strings! How funny, my Stanley sits on the quilt as it goes through the machine but I haven't seen him in between one... Yet! Great helpers are hard to come by! They are so cute, I wish I had helpers like that. Your helpers are really beautiful and so clever! They know just where to be ... to feel cozy , loved, and in the center of our attention! 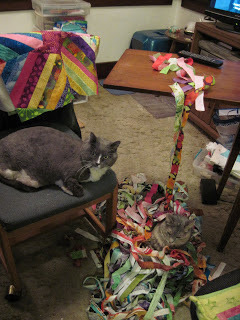 I especially love your kitty napping in between the quilt layers on your machine! Fancy Smokey climbing in between the quilt sandwich. What pretty kitties, I guess Smokey wants a hammock! Your fur babies are adorable!!! They know how to make themselves cozy!! What sweet helpers, I love that Smokey found the perfect spot to get all cozy while it was on the quilting machine! What a great bunch of felines you have - wonderful! I sure do have helpers like you do and wouldn't change it for the world. Cute photos of your kitties.